Measure of age in soil nitrogen could help precision agriculture. 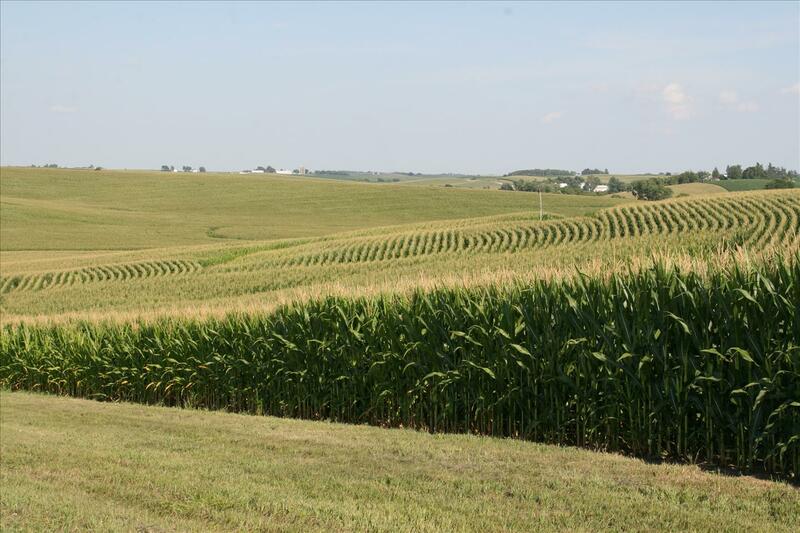 Corn fields in Iowa: Site of NSF's Intensively Managed Landscapes Critical Zone Observatory. Credit: Praveen Kumar. Researchers Praveen Kumar and Dong Kook Woo of the University of Illinois published their results July 25 in the journal Water Resources Research, a publication of the American Geophysical Union. The National Science Foundation (NSF) supported the research through its Critical Zone Observatory for Intensively Managed Landscapes, one of 10 such zones. "By understanding how long nitrogen stays in the soil and the factors that drive that, we can improve the precision at which we apply nitrogen for agriculture productivity," Kumar said. "We may be able to apply fertilizer specifically in areas that are deficient in nitrogen in precisely the amount that the plants need to uptake, rather than just applying it uniformly. Potentially, we could see a significant reduction in fertilizer amounts." "Nitrogen, usually in the form of nitrate fertilizer, is needed for healthy crop production, but too much is not a good thing, since the excess can contaminate water supplies," said Richard Yuretich, program director in the NSF Division of Earth Sciences. "Knowing how long nitrate resides in the soil will lead to more efficient agriculture that maximizes plant health without overdosing the environment." Kumar and Woo developed a numerical model to calculate how long inorganic nitrogen has been in the soil, using a corn/corn/soybean rotation common in the Midwest. Fresh fertilizer application or microbial production of nitrates and ammonium are considered "age zero" in the numerical model. From there, the researchers computed age by the chemical reactions or transformations nitrogen goes through in the soil, mediated by moisture, temperature and microbes. The model revealed two surprising findings when comparing the average age of nitrogen in the topsoil with deeper layers and in comparing corn fields with soybean fields. "The biggest surprise was that we found a lower average age of nitrogen in soybean fields," Woo said. "We use fertilizer on corn, not soybeans. Yet, even though we count that fresh fertilizer as age zero, we found a lower average age of nitrogen in soybean fields. We found that is mainly because soybeans uptake the old nitrogen, so the average age is reduced." When looking at the layers of soil, the researchers initially expected that nitrogen would follow a similar age path to water: newer on top, and growing older as it migrates down through the soil. However, they found that the nitrogen in topsoil had a relatively high average age compared with the water. Looking more closely, they realized that one of the forms of nitrogen — ammonium — accumulated in the topsoil. "Ammonium has a positive charge, which adheres to the soil particles and prevents it from leaching to the deeper layers," Woo said. "Because of that, we observe relatively higher nitrogen age in the upper layers compared with the age of the nitrate that dissolves in water, which doesn't have that barrier and can migrate down through the soil."